Touted as the latest innovation in fleet management, ODO, was pushed live last night, at a glittering event in Searceys at the Gherkin in the heart of London. Created by British automotive technology company, Drive Software Solutions Limited (DSSL), ODO uses their established Drive Platform currently available in 20 countries, combined with the Software as a Service (SaaS) technology of the Oracle Cloud for the first time. Consequently, it is designed to fill a gap and creates what the company claims is the world’s first fleet management system designed specifically for small and medium sized businesses. What really appeals about ODO, is that its platform is so simple to use, so in addition to Fleet Managers, it can also be used by HR managers, financial managers, business owners and SME business drivers on the go. So what does ODO do? Well, it basically stores vehicle and driver data. Vehicles can simply be added to ODO via their registration, as the system then searches DVLA data to find the remaining details. 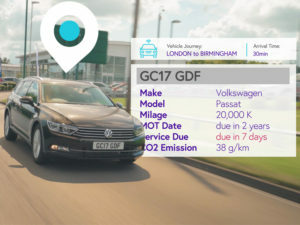 It can deliver cost savings by checking vehicles against Cap HPI data, who are also a partner, to look at fuel efficiency and can even give current values. Last but definitely not least, it helps fleets remain compliant by giving alerts and reminders on both drivers and their vehicles, by checking all company vehicles have up-to-date MOTs, insurance and service records, inputting a company car driver’s latest journey details, or just trying to work out when a specific vehicle is due for change. Also impressive, is that despite all the innovation that ODO offers SME fleets, there are no up front cost barriers to using this new fleet management solution — as you can try it for 30 days for free. Then, if you use the Professional level of service, it costs £3 per vehicle, rising to £5 per vehicle for the Expert level of service, although we were told discounts could be arranged for a number of vehicles signed up to ODO.